There are 3 quests in Shal'aran Suramar (Cave at 35.0, 47.6). All of them work like daily quests. You feed NPC with 50 Mana Ancestral and he gives you a buff and 50 reputation with the Os Noctívoros. Can buy buff at any time, but reputation quest can be done once in 24 hours. It shows how long you have to wait till the next time you can feed the npc. You can't interact with npc if they need food, so feed them if you want to complete quest or start a new one. 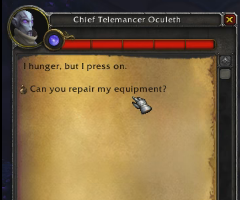 You need to progress in Suramar storyline to get npc in Shal'aran. You can see full quest chain here: Noctívoro, mas não esquecido. Although these quests can be done daily, they're not 'technically' dailies since the quests reset 24 hours from the time you last completed it. This means you can work out when the quest will next be available using the red bar and a bit of simple maths. The bar has 100 points, and depletes in 24 hours. This means 1 point depletes every 14.4 minutes (or 14 minutes 24 seconds). So if you have 9/100 on the red bar the next quest will be available in approximately 129.6 minutes (or 2 hours 9 minutes 36 seconds). Obviously it could be up to 14.4 minutes less than that depending on how close the timer is to depleting the next point... but you get the idea. Anyone know what quest cancels the Feed Occuleth, Feed Thalyssra and Feed Valtrois daily quests? It doesn't seem to be rep related, I'm exalted with them and they still need feeding every time (with no rep or other reward).